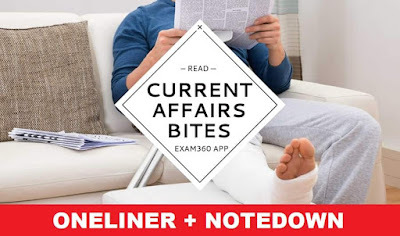 One Liner GK Current Affairs of 4th April 2018 has all the Latest news in single sentences with static points given at the end of the article. You may go through the Daily Current Affairs Quiz and Current Affairs Updates. These are important for the upcoming examinations of Bank, Rail and SSC like IBPS, SSC CGL, SSC CHSL and RBI or RRB. We hope our article will be helpful to you. The National Institutional Ranking Framework (NIRF), 'India Rankings', India's own top university rankings under 9 different categories is being released by Human Resources Development (HRD) Indian Institute of Science (IISc) Bangalore and Indian Institute of Technology, Madras topped the NIRF ranking in overall category while IISc Bangalore and JNU topped the universities category and Miranda House ranked top in colleges' category. According to a report released by Startupblink, a global startup ecosystem map with tens of thousands of registered startups, coworking spaces, and accelerators, the Indian startup ecosystem is ranked at number 37 and the global ranking of its top three cities are Bengaluru, New Delhi, and Mumbai. The trial run of the first container train between India and Bangladesh was flagged off from Kolkata city on Tuesday. Karnataka is the only state to launch intra-state movement of goods. A world-class interpretation centre and other tourist facilities for visitors were today inaugurated at the Konark Sun Temple, coinciding with Utkal Diwas -- Odisha's foundation day. The Central Board of Direct Taxes (CBDT) has entered into 14 Unilateral Advance Pricing Agreements (UAPA) and 2 Bilateral Advance Pricing Agreements in March 2018.